I’ve been getting DPS skis onto the feet of quite a few local skiers over the past few years. It’s been allot of fun, operating a low-key retail outlet from my house, and selling skis that I use and can honestly endorse. But the brand is growing, and to expand sales beyond the limited circle of people I’m connected to would require a conventional storefront, which I’m happy to leave to one of the established players. Instead I’m now focusing my restless energies on establishing a backcountry ski cabin. I have a particular vision that I’ve long dreamed of creating, and for the past few years I’ve been systematically exploring the region for a suitable location. 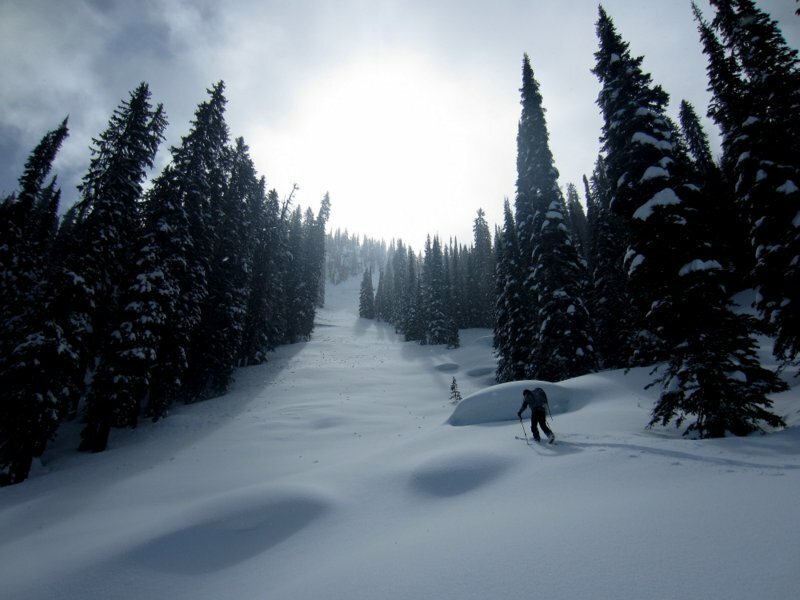 Finding high quality ski terrain isn’t too difficult in the Kootenays, but finding an area that doesn’t conflict with the multitude of existing commercial, cultural, and environmental interests and issues was much more challenging. After ruling out many possibilities, I eventually settled on what I hope will be an available area in the Southern Valhallas, and recently submitted a formal application for a commercial recreation tenure. Now the government is conducting a comprehensive review and referral process, and within a few months I’ll find out if my dream can progress to more practical matters. 100m from the proposed cabin. Good luck Stew in following your dream! I better look at that new sled, hey Stew ?. good luck…quite a dream come true if it materializes. All the best! Keep me posted Stew. There is a swath on interested and able people down here who’d love to hook into that experience. Cheers. wow looks a great spot mate, good luck with it and remember, rust never sleeps. as a fellow rosslander, i’d be around to pay for use of a nice new cabin, or accept beer for assistance in building it. or both! good luck with your endeavour.